Finding the perfect electric guitar is no easy task. Fortunately, Guitar World has taken care of much of the heavy lifting—and, admittedly, rather enjoyable playing—for you. This list of 10 great electric guitars hits on a variety of shapes and styles, and offers guitars that sport exceptional quality and build along with high-end features and finishes, all at an under-$2,000 price point. From Strats to signature models, Sustainer pickups to EverTune bridges, and sleek seven-strings to hot-wired shred machines, Guitar World has the instrument for you—no matter what style and sound you’re looking for. At first glance, the American Professional Telecaster seems like the classic version of the iconic electric solidbody model that most guitarists know and love, with an alder body, maple neck with a satin urethane finish on the back, 25.5-inch scale length, a 9.5-inch radius, 22 frets, master volume, master tone and a three-way pickup selector. However, subtle differences are immediately apparent the moment you pick it up and plug it in, such as the narrow-tall frets and the distinctively comfortable feel of the modern “Deep C” neck profile, a treble-bleed circuit that preserves high frequencies when turning down the volume and a three-saddle bridge design that looks familiar but has compensated brass barrel saddles for accurate intonation and a flat plate with no raised edges above the saddles. What’s more, the American Pro Tele sounds absolutely amazing. The two V-Mod single coils are beefy and ballsy with twang that packs a solid punch. It’s tone that vintage connoisseurs spend years searching for while pros go on endless quests for the ideal replacement pickups. Yet here it is in an affordable, off-the-shelf, brand-new instrument. What’s more, the Tele design may be a classic, but the new model comes in a wide variety of traditional and unconventional finish colors and styles. The Pacifica 612 VII FM is no exception, offering an alluring combination of high-quality tonewoods, hardware and electronics along with superior craftsmanship and playability. The 612 VII FM features a sleek, modern “superstrat” design with deep, sweeping cutaways and comfortable contours. What’s really impressive about the guitar is its first-class hardware and electronics, which make the usual pro-quality upgrades unnecessary, unlike most other guitars in its price range. Pickups consist of a Seymour Duncan SSL-1 single coil at the neck, a reverse wind/reverse polarity SSL-1 single coil in the middle position and a Seymour Duncan TB-14 humbucker with a chrome cover at the bridge. Thanks to those pickups, the 612 VII FM is a tone monster. The single coils deliver impressively fat and harmonically rich tones, and their output is perfectly matched to the humbucker so there is no volume drop when changing pickups. The reverse wind/reverse polarity SSL-1 middle pickup provides completely noise-free performance when the neck/middle or bridge/middle setting is selected, while still delivering the desirable out-of-phase “quack” that Strat players adore. With its immaculate craftsmanship, comfortable design and pro-quality hardware and electronics, the 612 VII FM is a great bargain on today’s market. Ibanez introduced the Talman in 1994, when alternative music was a dominant force, and the quirky axe attracted players like Noodles (the Offspring), Kevin Shields (My Bloody Valentine), Tom Morello and Billy Corgan before going out of production only four years later. But a few years ago, the company resuscitated the Talman, only this time with designs inspired by vintage classics instead of pawnshop prizes. The Prestige TM1702M boasts a compact, contoured offset body shape, as well as a maple neck and fretboard, contoured neck heel and an offset 3-by-3 tuner configuration for the Gotoh MG-T tuners with locking machine heads. Pickups are Seymour Duncan passive single-coils in a configuration similar to that of a Telecaster, with an angled bridge pickup mounted to a flat metal bridge plate, a neck pickup featuring a chrome-plated cover and a three-position pickup selector switch. Sonically, the pickups provide all the percussive spank and twang, brilliant treble and throaty midrange of a classic Tele. Furthermore, an IFX-PRO bridge features six individually adjustable flat, solid metal saddles, while the strings are anchored through the alder body. The coolest feature of Ibanez’s Talman models—new and old—is its exceptionally comfortable body shape, which is light and extremely well-balanced. While it wasn’t designed to be a supersonic shred machine, Ibanez’s expertise in that area is well reflected by the TM1702M’s exceptionally comfortable playability, which enables players to navigate the entire neck with ease. Is the shape too outside the PRS norm? 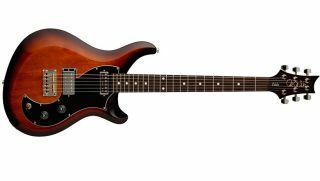 While the Vela shares a few common attributes with other S2 series guitars, it also introduces PRS’ first offset body shape, the PRS S2 Type-D single-coil pickup and a “new” plate-style bridge with two brass saddles. The end result of the Vela’s design is something that's not only different from the rest of the PRS lineup but also different from any other guitar available today. The S2 Vela’s body is crafted from lightweight mahogany that delivers lively resonance, and boasts generous bevels and contours as well as a deep cutaway scoop for a slim, sleek feel that is very comfortable to play for hours. The neck is also mahogany, and the fretboard is a generously thick slab of Indian rosewood decorated with either standard dot or optional PRS signature bird inlays. In addition to the Pattern Regular profile and 25-inch scale length, the neck features 22 medium jumbo frets. Pickups are a PRS S2 Starla bridge humbucker with a coil-tapping function that's activated by pulling up on the master tone knob (other controls include master volume and a three-position pickup selector toggle switch) and the aforementioned PRS S2 Type-D single-coil at the neck, which is based upon the look and general design of the vintage DeArmond Dynasonic. The versatile and responsive sounds of the S2 Vela are among its most impressive attributes, with a natural acoustic tone that is lively, dynamic and resonant, with the pickups delivering a surprising variety of outstanding tones from such a deceptively simple setup. The Vela is undoubtedly built to rock, but more rock-oriented modern country players who want a little twang with their stang will love it as well. For players who prefer a hardtail bridge, a traditional (i.e. non-slanted or multi-scale) fretboard, passive pickups and a non-extended scale length, Jackson’s Pro Series Soloist SL7 HT is a great choice. Priced right in the middle of Jackson’s seven-string range, it offers a great balance of value and pro features. The most distinctive feature of the SL7 HT is its body construction, which places a layer of ash with a distinctive transparent satin Charcoal Gray finish on top of a slab of mahogany. The single-piece maple neck extends all the way to the body’s heel for true neck-through-body construction, but ash laminates on the sides and back give the body a consistent look. Consistent with Jackson’s other Soloist models, the SL7 HT is a speed machine with a very fast-playing neck that, despite having a very slim profile, feels rock solid. The high-output Duncan SH-6 humbuckers deliver remarkably clear and well-balanced sound. Thanks to treble and midrange emphasis with slightly rolled-back bass, the pickups allow the low B string to produce a brilliant, metallic clang rather than the deadened mush one often encounters on seven-string guitars with non-extended scales. As a result, the SL7 HT sounds as good when played with a clean amp setting as it does when pushed to the brink with high-gain distortion. A Tele-shaped model with a hard tail bridge, the Pro-Mod San Dimas Style 2 HH HT M comes with a beautifully grained natural ash body coupled with a two-piece bolt-on maple neck. In a smart design move, the body is contoured with a generous belly cut to hug your midsection, a contour on the cutaway and a heel for unfettered access ahead of the 15th fret, in addition to a slick contour behind the lower bout for the output jack. Performance-wise, the Style 2 feels like a wild bucking horse—once you strap yourself in, you can’t help but hang on as your playing heads toward breakneck speed. The fast-neck profile with a hand-rubbed urethane gel back finish is so smooth it allows your fingers to effortlessly skate across the whole neck. When it comes to the guitar’s sound, Charvel was wise to use the darker-voiced Seymour Duncan humbuckers to balance the ash body’s brighter tone characteristics. Here, the pickups have a strong midrange that makes chords sound chunky when using high-gain amplifiers, while leads have the perfect bite and roundness that slice through the mix. Engaging the volume’s push/pull coil split brightens up the tone for single coil spank. This is a totally versatile hard rock masterpiece stripped down for dexterous guitar acrobatics. The Epiphone Tony Iommi Signature SG Custom offers an ideal balance between classic SG appeal and modern, customized upgrades. The contoured double-cutaway mahogany body, mahogany neck with a fast, slim profile, three-layer black/white/black “single wing” pickguard and “pineapple” (or crown) headstock inlay all evoke the original SG. However, upgrades and modern features abound, including the ebony fretboard with 24 low-profile medium-jumbo frets and pearloid cross-shaped inlays, a smooth-transition neck heel that gives the deep set neck the feel of a neck-through-body design, a recessed output jack, black graphite nut and a pair of Gibson USA Tony Iommi Signature humbucking pickups with Alnico II and ceramic magnets. The EverTune bridge, which provides amazing tuning stability and intonation—just try to knock this baby out of tune—is the selling point here, but the EC-1000ET is a beauty besides. The guitar features a mahogany body with maple cap, a three-piece mahogany set neck and impeccable construction. Pickups are Seymour Duncan, and lend the guitar a range of tones, from full and aggressive with the bridge ‘bucker engaged, to more rounded and mellow with the neck. And the playability is impeccable. It's a guitar that's perfectly tuned and intonated up and down the neck and not only sounds great, but allows you to riff and solo with confidence. If never going out of tune is important to you (and how could it not be? ), this is one of the best electrics going today. The semi-hollow Starfire was first intended to compete with Gibson's ES-335 but still boasts plenty of classic Guild style, including spacious cutaways and a wooden foot Tune-o-matic-style bridge. The new Starfire V sports mahogany laminates with a striped figure under the Cherry Red finish and, unlike the Starfire IV, adds in a Guild vibrato. The three-piece neck joins the body at the 18th fret and features a 'soft U' profile, and is topped with a rosewood fingerboard. Soundwise, the guitar is bright and bold, with plenty of low-end definition. The LB-1 "Little Bucker" pickups here replicate the early Sixties-era “Anti Hum Pickups,” and come with their own tone and volume controls. Though the Starfire is a little weighty around the neck due to the maple center block, it has all the ease and easy playability you would expect from a thinline design. A partnership between Fender and Radiohead guitarist Ed O’Brien, the EOB Strat offers a wide palette of tones, thanks to its Seymour Duncan JB Jr. humbucking bridge pickup, Texas Special single-coil middle pickup and Fernandes Sustainer unit in the neck position. The Sustainer creates near-infinite sustain on one or more strings, making it easy to achieve thick, textured sounds. Controls include an on/off switch, intensity control and a three-position switch to select the mode: Fundamental only, Harmonic only or Blend. Other modern and classic features include a six-saddle vintage-style synchronized tremolo bridge, vintage-style tuning machines, a “10/56 V” neck profile, 21 narrow-jumbo frets, a synthetic bone nut and a special neck plate engraved with a custom “Flower of Life” emblem. Furthermore, the guitar’s ethereal all-white design is a perfect complement to its otherworldly tones.